The Atlantic States Marine Fisheries Commission (ASMFC), which oversees migratory fish along the coast, is preparing to update its menhaden management plan this fall. It’s looking to revisit how the catch is distributed among states and fisheries and may adjust the catch limit for the Chesapeake. Public hearings on potential changes are scheduled for September, with written comments accepted through Oct. 20. It should be noted that a July ruling by the U. S. Commerce Department has thrown into doubt the ASMFC’s authority in regulating fisheries. The federal ruling allowed New Jersey, one of the 15 states regulated by (and represented on) the ASMFC, to reject the commission’s harvest restrictions on Atlantic flounder, which has been declining since 2000. It’s the first time since the commission was authorized by Congress in 1993 to adopt and enforce coastwide harvest restrictions that a state has been allowed to ignore the commission’s harvest regulations. Fisheries managers are concerned that other states might follow suit if pressure from fishing interests is great enough. Regarding menhaden, people generally don’t eat the small, oily fish, yet it has been the focus of heated debates in recent years over how many should be caught. 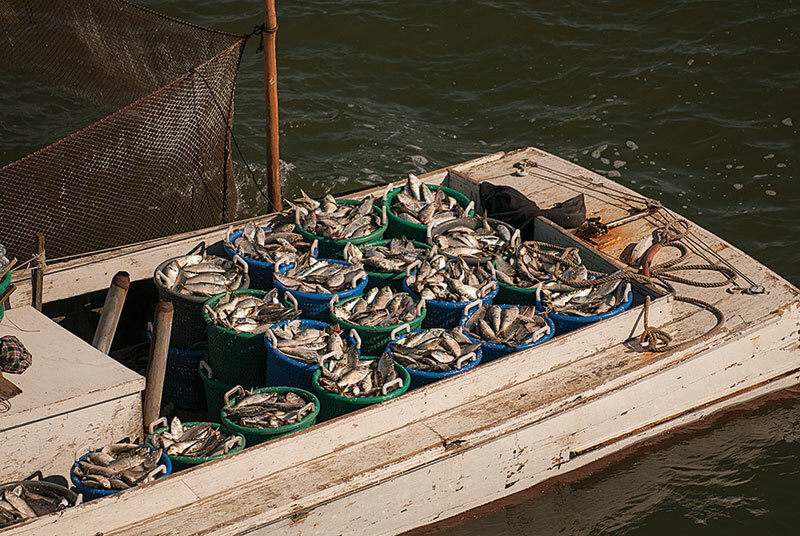 By weight, menhaden are the largest catch in the Bay, primarily because Reedville, VA — home port of Omega Protein's “reduction” fishing fleet — is where the fish are reduced (processed) into vitamin supplements, fish meal and other products. The Omega fleet’s menhaden harvest accounts for about 75 percent of the coastwide catch, with the rest taken by small, but growing, operations that sell the fish as bait for recreational and commercial use. The commission released a stock assessment update in August showing that the population was healthy and not overfished. But some conservation and recreational angler groups contend such reviews fail to account for menhaden’s ecological role. Menhaden are an important forage fish, a prime source of food for striped bass and weakfish; birds such as osprey and eagles; and marine mammals such as whales and dolphins. The ASMFC has said it plans to establish a new ecological reference point and has been working with technical advisers for several years to develop models that help identify how many menhaden should be left as forage for other species, but that effort will not be complete until late 2019. Conservation groups argue that the ASMFC could look to recent reports offering general guidance about the amount of forage fish that should be left uncaught; those recommendations could be adapted to the menhaden stock until the ASMFC modeling effort is complete. Another recent study, though, cast doubt on whether reports that look at all forage fish together can be applied to an individual species. For now, the ASMFC is considering its options, which range from abandoning the setting of any ecological reference points altogether; waiting for the ASMFC’s ongoing modeling work to be completed; or adopting one of several reference points derived from other forage fish reports — some of which could force reductions in current fishing levels. The commission is also taking comments about the reduction fishery harvest cap within the Chesapeake, which is intended to help spread catches out along the coast. Options include maintaining the current cap at 87,216 metric tons a year; reducing it to 51,000 metric tons, roughly the average catch over the last five years; or eliminating the cap altogether. Meanwhile, the ASMFC is also seeking input on how the catch should be divided. It established a coastwide cap in December 2013 and set limits for each state and different parts of the fishery. That has proven problematic for many reasons, among them that historic harvest data kept by several states were inadequate for setting the original catch limits. The commission is considering a wide range of options, including new state allocations, new allocations between the bait and reduction fisheries, and quotas by gear type. A draft “Amendment 3” to the menhaden management plan that outlines the various options is available on the ASMFC website. When the commission meets Nov. 13 and 14 in Linthicum, MD, it plans to consider adopting the amendment and setting specifications for the 2018 fishery. Maryland Department of Natural Resources: 6 p.m. Sept. 18. Annapolis location to be determined. Contact: Lynn Fegley,410-260-8285. Potomac River Fisheries Commission: 6 p.m. Sept. 19. Carpenter Building, 222 Taylor Street, Colonial Beach, VA. Contact: Martin Gary, 804-456-6935. Virginia Marine Resources Commission: 6 p.m. Sept. 20. Northumberland High School, 201 Academic Lane, Heathsville, VA. Contact: Rob O’Reilly, 757-247-2247. Virginia Marine Resources Commission: 6 p.m. Sept. 21. 2600 Washington Avenue, 4th Floor, Newport News, VA. Contact: Rob O’Reilly, 757-247-2247.